Black Dog is thrilled to announce our new classes for new drone operators and those interested in finding out more about flying drones before taking the plunge. This class is designed for newer, non-commercial drone owners looking to fly for fun or recreation and wanting to learn the correct, legal and safest ways to fly. Even though you are not flying commercially, there are still very important rules and safety measures to be aware of. We also examine different drone models to help you decide which model is right for you and cover tons of tips and techniques to practice and sharpen your flying skills. Of course, we also have an introduction to the incredible world of aerial photography. Also available are more advanced sessions on camera settings, image composition and accessories to bring your aerial photography alive. ​Sessions are available to small groups, families or even one-on-one personalized instruction. You simply will not find this level of attention that is focused on YOU and your individual flying interests anywhere else. Contact Black Dog today to take the next step in pursuing your love of flying a drone! Bring your drone (if you have one already) and your questions and be ready to have fun! Get in touch today to schedule your drone flight class! The sky is changing with more and more UAS (Unmanned Aircraft Systems) being deployed in thousands of new ways. Everything from real estate photography to home and insurance inspections can now be done faster and more efficiently while being safer and less expensive than ever before. Professional drone services now offer amazing UHD 4K video and the highest quality still images for virtually any need. Less turn around time make it easier than ever before to capture higher elevation views. Roof inspections and other imagery needed for insurance purposes can be achieved quickly and safely with highly detailed images thereby speeding up the entire process and eliminating the need for dangerous situations. These are just a few popular examples of how UAS missions are helping businesses and individuals every day. ​The sky, literally, is the limit for what UAS operations can do for your business. Contact me today to find out how we can bring this advanced level of services to your activities. Terry Jarrell is certified by the FAA as Part 107 Remote Pilot for Small Unmanned Aircraft Systems, sUAS. This is a strict, formal process involving training and understanding of elements including federal rules and regulations, National Airspace System, emergency procedures, sectional charts, aeromedical, risk factors and weather, among others before successfully passing the required FAA exam and screening process. 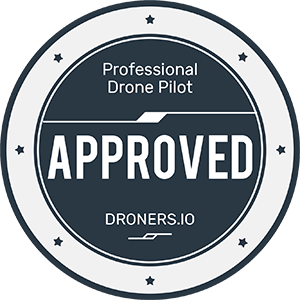 ​Droners.IO is a leading source linking qualified remote pilots to clients in need of professional aerial services. Black Dog Drone Operations is proud to be a member of the world's largest network of professional commercial drone pilots.